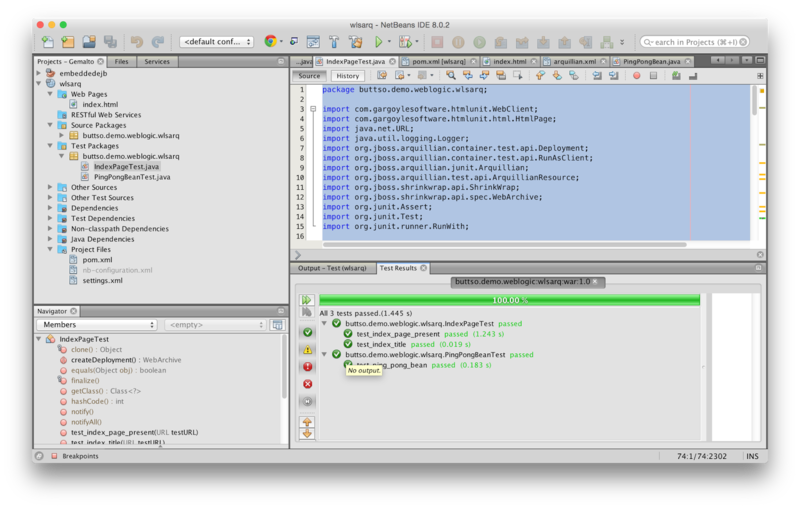 The Arquillian project is proving to be very popular for testing code and applications. It's particularly useful for Java EE projects since it allows for in-container testing to be performed, enabling unit tests to use dependency injection and all the common services provided by the Java EE platform. Arquillian uses the concept of container adapters to allow it to execute test code with a specific test environment. For the Java EE area, most of the Java EE implementations have an adapter than can be used to perform the deployment of the archive under test and to execute and report on the results of the unit tests. There are multiple adapters available for use. Some of them are historical and some are for use with older versions of WebLogic Server (10.3). We are actively working with the Arquillian team on finalizing the name, version and status of a WebLogic Server adapter. These adapters utilize the WebLogic Server JMX API to perform their tasks and are the adapters used internally by the development teams when working with Arquillian. They have been tested to work with WebLogic Server [12.1.1, 12.1.2, 12.1.3]. We also have been using them internally with the 12.2.1 version under development to run the CDI TCK and other tests. This example has the most basic configuration you can use to employ Arquillian with a Maven project to deploy and execute tests using WebLogic Server 12.1.3.